On Saturday, 10 March 2018 the Mayor of Colchester unveiled our latest Interpretation Board at the northwest corner of the Wall at the junction of Middleborough and Balkerne Hill. The photo shows the Mayor, Friends Chairman, Henry Spyvee and Roman soldier, Cllr. Darius Laws with the new Board. The Board was erected with kind support from the Sixth Form College. An extensive archaeological dig was carried out in this area in the 1970s. It discovered evidence of Roman buildings outside the wall dating from the 3rd and 4th centuries period. Nearby was the site of a Roman villa, where some magnificent floor mosaics were discovered. Our Board displays an 1849 drawing of the Wall in this area, showing its height, a reconstruction of how the Wall was built and an image the Middleborough mosaic found in front of the Wall in 1979 when the town’s Cattle Market was removed. The mosaic is now displayed in Colchester castle museum. The board is just outside HainesWatts’ offices on Balkerne Hill. 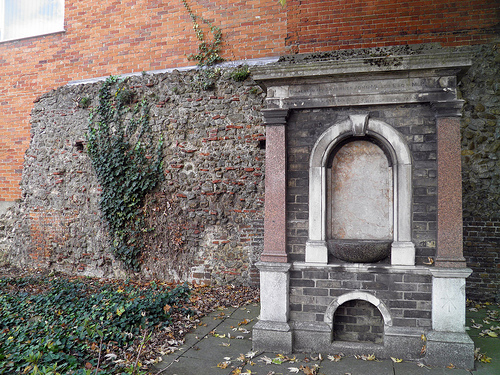 It tells the story of the damage to the Wall and to St. Mary-at-the-Wall Church tower during the 1648 Siege of Colchester. It also busts the myth that the nursery rhyme ‘Humpty Dumpty’ was based upon a Civil War cannon positioned on the church tower. Sadly there is no evidence for this nice tale. in some respects our Wall is being better displayed now than it has been in the past. 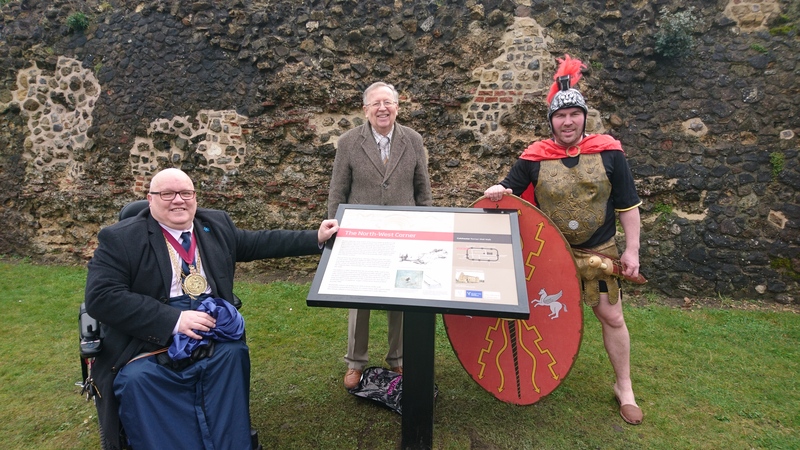 The latest interpretation board was unveiled in Sir Isaac’s Walk on Saturday 22 April by Colchester’s MP, Will Quince, accompanied by an honour guard. The board was installed near to the site of the 1648 Battle of Headgate and features a specially-commissioned painting of what happened that day created by local artist Roger Massey Ryan. 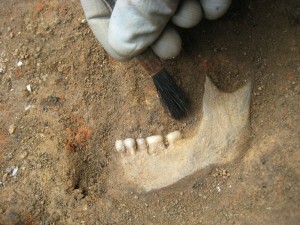 The bloody encounter took place right at the start of the devastating siege of Colchester in the English Civil War. On 13 June 1648, Parliamentarian forces attempted to break into the town through the Head Gate but were repulsed by the Royalists inside. The board was sponsored by the local solicitors’ firm Ellisons to mark their connection to the battle. During the siege, the building which now houses their offices was used to hold prisoners of war. The illustration on the interpretation board shows a white flag flying over it – to warn the besieging forces not to attack it. Ellisons chose to sponsor the board to mark the company’s 250th anniversary. 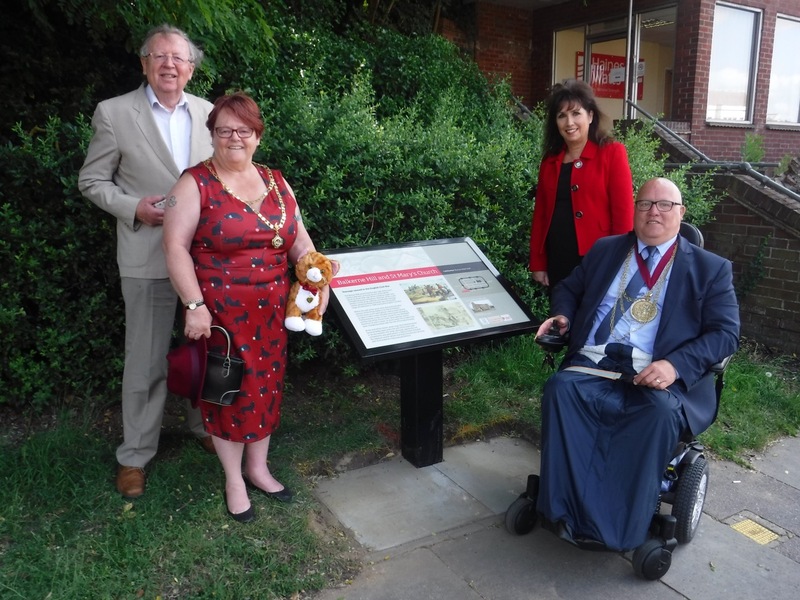 On Saturday 26 November 2016, the Mayor of Colchester, Cllr Julie Young, unveiled the interpretation board at the top of the Scheregate steps. 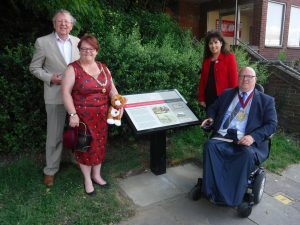 This board was sponsored by the Colchester Tourist Guides Association and many of its members were present to mark the occasion. The board commemorates two aspects of the wall’s history. 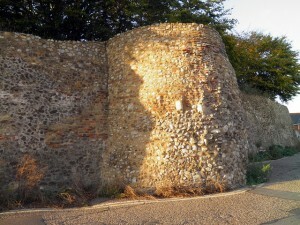 First, the opening in the wall that was made in medieval times to allow visitors to reach St John’s Abbey more easily and, second, the life of ‘Freddie the Shrimp-Man’ who, for most of the 20th Century, used to sell his shellfish at the top of the steps. The ‘Scheregate’ is the only surviving medieval gate in the wall and its name is derived from the Anglo-Saxon word scaerd, which means ‘gap’. The current timber-framed buildings around the gate date from the 17th century. Then, as now, the steps leading down would have been lined with shops. 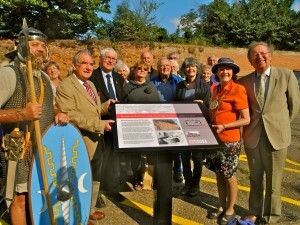 On Friday 11 September 2015 the fifth wall interpretation board was unveiled by the Mayor of Colchester Cllr Theresa Higgins and Mark Davies representing the Colchester Archaeological Group. The Group chose to sponsor this board because of its links with this particular site. The Group’s first excavation, in 1965, recorded the foundations of the bastion that once stood here. On the face of it the Wall at this point is made up of brick, some of it obviously very modern. In fact this point was the site of a breach in the Wall at the time of the 1648 Siege. It was knocked down by Parliamentary cannon located on Magdalen Green nearby. Also visible here are the surviving bastions. Four of the original eight remain above ground. These were erected after the Peasants Revolt of 1381 when the authorities were worried by the possibility of further rebellion. 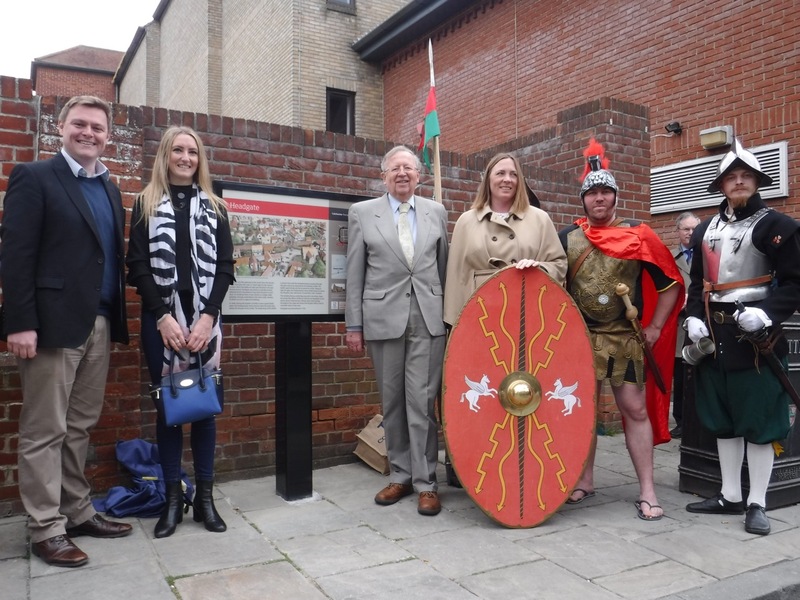 Please join us as we unveil the fifth Roman Wall interpretation board at 10am on Friday 11 September 2015. This Board has been kindly sponsored by the Colchester Archaeological Group and it will be unveiled jointly by the Mayor of Colchester, Cllr. Theresa Higgins, and the CAG Chair and Friends Trustee, Mark Davies. The Board will stand on the land of Priory Street Car Park, almost opposite the entrance to The Dell Retirement Homes. The Chairman of the Friends, Henry Spyvee, comments ‘If ever there was a Board which perfectly illustrates the need for interpretation of our Wall, this is it.’ On the face of it the Wall at this point is made up of brick, some of it obviously very modern. In fact this point was the site of a breach in the Wall at the time of the 1648 Siege. It was knocked down by Parliamentary cannon located on Magdalen Green nearby. Also visible here are the surviving bastions. Four of the original eight remain above ground. These were erected after the Peasants Revolt of 1381 when the authorities were worried by the possibility of further rebellion. 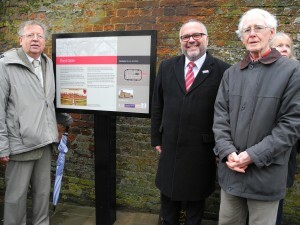 The Friends are very pleased to announce the unveiling of the fourth of our heritage interpretation boards. 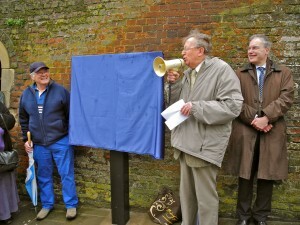 On 21 March 2015 Sir Bob Russell, then the town’s MP, along with his family and supported by Colchester’s mayor, Cllr John Elliott, formally revealed the board. Sir Bob and his family generously sponsored the board, with other costs paid for by the Friends and the Borough Council. The board stands next to what was the North Gate of the Roman city and, in more recent history, the Colchester cattle market. The market operated at Middleborough from 1862 until 1975. A trough stands nearby to commemorate the site’s former function. The North Gate was one of the main entrances to the Roman city. Its upper levels and central gateway were removed in 1774 and most of the rest of the remains cleared in 1823. There is very little now to show the magnificent structure that was once in place. The interpretation board is a reminder of what was once there. Please come and admire! 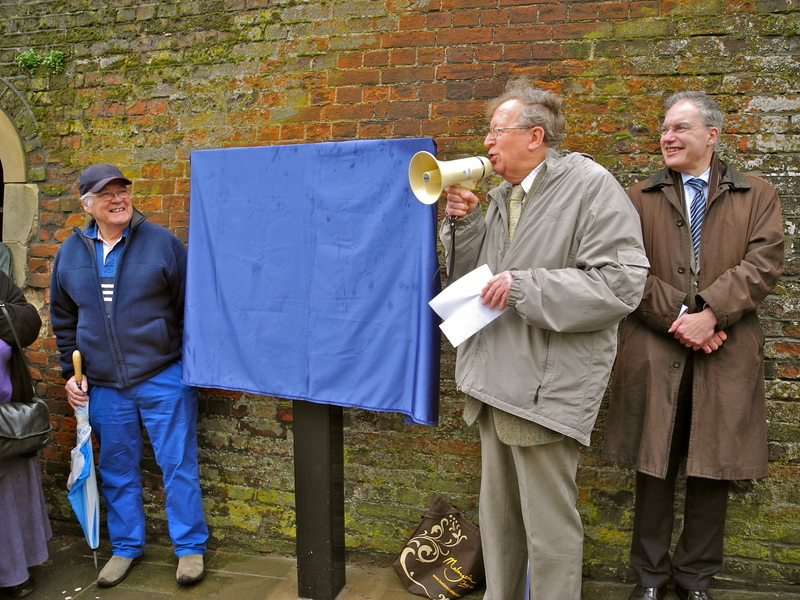 Please join us for the unveiling of the fourth interpretation board on Saturday 21 March 2015 at 10am. The interpretation board has been generously co-funded by Sir Bob himself in conjunction with the Friends and the Museums Service. 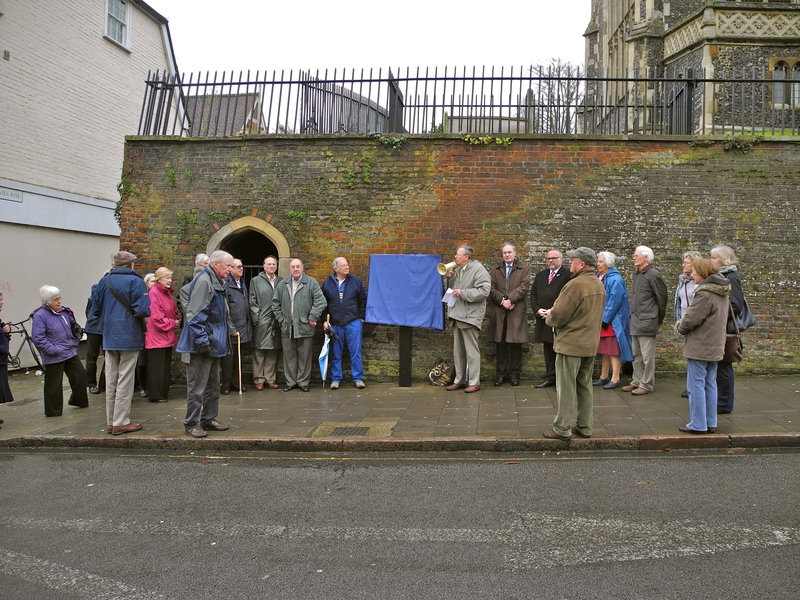 Northgate is where the Friends won their first battle to improve the setting of the wall, with the removal of a set of large advertising hoardings. 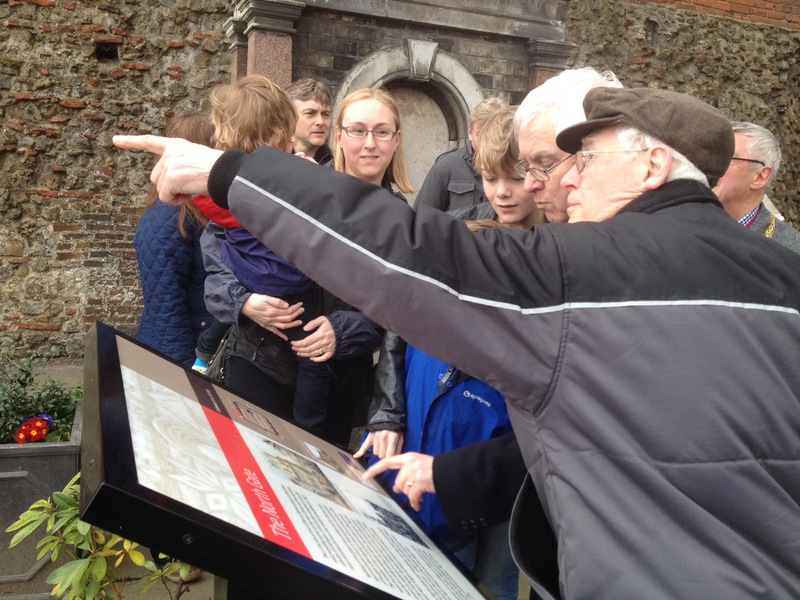 We hope that the installation of the interpretation board will encourage greater interest in the heritage of this part of Colchester. North Gate was one of the main entrances to the Roman city. Its upper levels and central gateway were removed in 1774 and most of the rest of the remains cleared in 1823. There is very little now to show the magnificent structure that was once in place. The interpretation board will be a reminder of what was once there. Please come and admire! Our fourth AGM will take place on Thursday, 5 March, 2015 at 7.30 pm in the Mayoral Suite at Colchester Town Hall. This relates to the year ending 30 June, 2014. However, the report on our work will be much more up-to-date. Barry Donovan wishes to step down as Treasurer so there is a vacancy there. Both Anthony and Barry have been with us from the start and have given us excellent support. Replacing Barry will be a challenge. After the business of the AGM Adam Wightman will talk to us about ‘BEFORE THE WALL – Excavations at the Williams and Griffins department store: further evidence for the effects of the Boudican uprising on the unwalled colony at Colchester.’ Adam is an archaeologist with the Colchester Archaeological Trust and has directed their dig at W & G’s. You may have seen him telling Richard Wilson all about this on ITV recently. The third of Colchester’s Roman Wall heritage boards was unveiled on Saturday 22 November – very kindly sponsored by the Colchester Civic Society to mark its 50th anniversary. 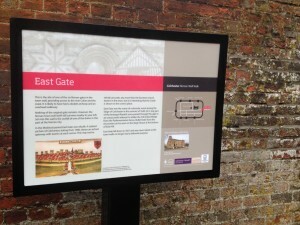 The bulk of the cost of the board was paid for by the Colchester Civic Society with the help of the Friends of Colchester Roman Wall and it was installed by the Colchester Museums Service. 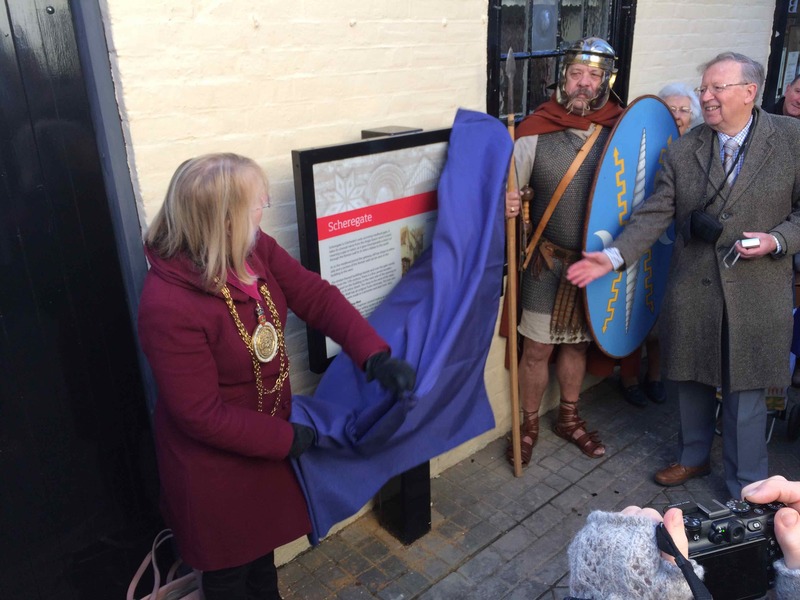 It was formally unveiled by Councillor Tim Young, CBC portfolio holder for heritage watched by a small crowd of members of the Civic Society and the Friends of Colchester Roman Wall. 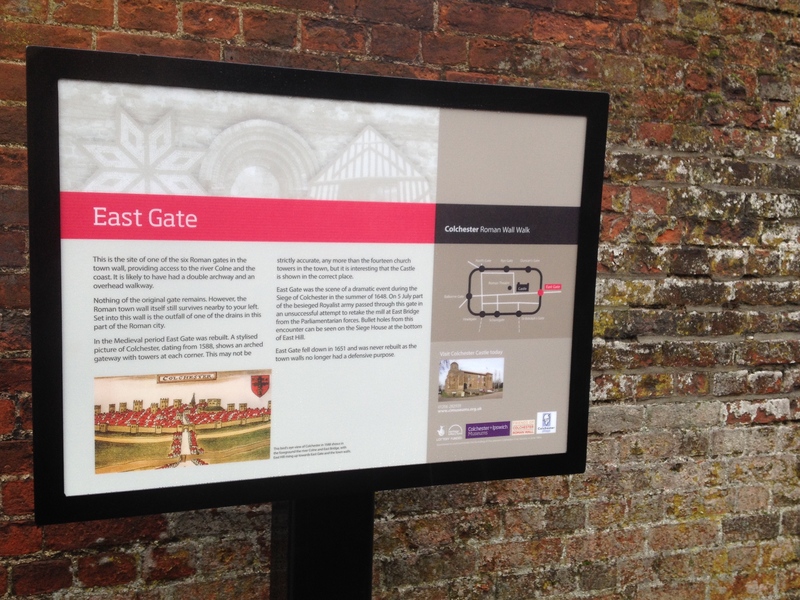 The board stands half-way up East Hill and explains the history of Colchester’s East Gate. The original gate was built by the Romans in the 1st century AD but later destroyed. All that remains are stretches of the Wall itself and a Roman drain. The gate was rebuilt in medieval times and was the site of a dramatic event during the Civil War siege of Colchester in 1648 when the besieged Royalist army attempted to recapture the East Bridge over the river but were repulsed by the Parliamentarians. The first two boards of the Roman Wall Walk were installed at Balkerne Gate near the Mercury Theatre, at Duncan’s Gate in Castle Park. The remaining boards will be installed over the next year or so to create a multi-stop tour explaining the history of the Wall.